As a frustrated architect (I couldn't do the math, so I settled for being a Graphic Designer), I have always been intensely interested in the man-made structures around me. You know, houses, buildings, and yes, freeways. Oddly enough, I have never, ever, met anyone who has considered freeways to be classified as "architecture". I guess you can't blame people for not seeing freeways as structures to be compared to skyscrapers and houses. But in places like Los Angeles, freeways are pretty much the most important, and visible, structures on the landscape. And in a great, shining, modern city, their ugliness just seems to be taken for granted. 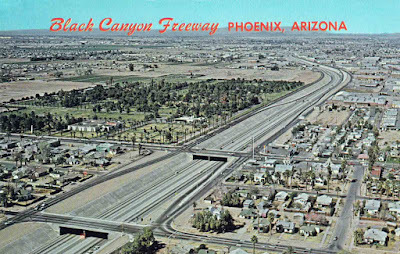 Maybe it's structures like the Black Canyon Freeway in Phoenix that makes me refuse to believe that it's all about "form follows function". Built in the 1960s, it was simply poured concrete. Not a trace of decoration, or art, or landscaping. As if no one was ever going to see it ever again, as if it were some type of sewer drain. But people spend a lot of time looking at freeways. And the greater Phoenix area is now figuring that out. Take a look at the newer freeways. There is artwork, there is landscaping. I suppose some people argued about that being distracting, or adding too much to the cost. Freeways are like any of the structures that surround us every day, from our houses to the insides of elevators. 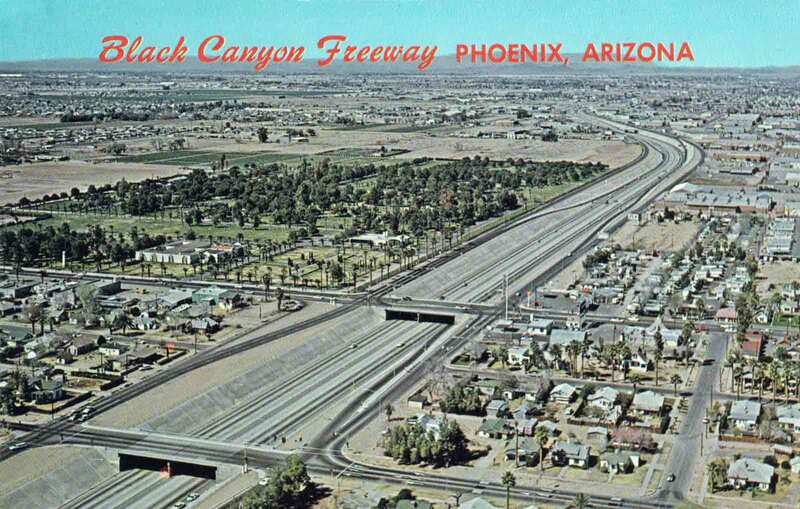 So take a look at the next freeway that you drive on in Phoenix. If it doesn't look like this, it's because the designers finally figured out that people don't want to have the world around them looking like a prison cell. Not even freeways.